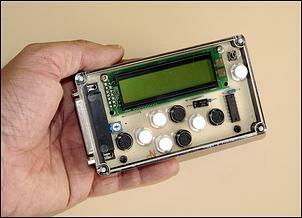 Is it possible to tune the air/fuel ratios in a car using nothing but a normal heated oxygen sensor and a multimeter? Well yes, sure it's possible - but how accurate are the results going to be? Recently we had a chance to put it to the test, comparing a 'multimeter tune' with the air/fuel ratios measured by a professional Autronic air/fuel ratio meter. And not content with that, we also used the opportunity to change the spring tension in a vane airflow meter and test a prototype of a new DIY kit interceptor. The need for the tune came about because after being purchased, it was found that the BMW was running stinkingly rich - as in, an average fuel economy of near 30 litres/100 km! 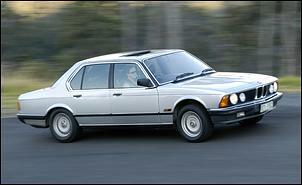 Like many older fuel injected cars, the BMW runs a vane airflow meter. 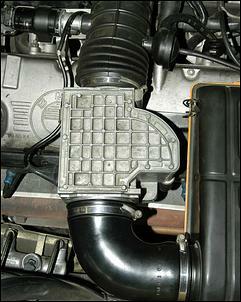 As the name suggests, this design places a door (the vane) in the passage of the intake air. As more air flows through to the engine, the door is pushed open wider and wider. The primary vane is connected to a secondary vane which works in a closed chamber, helping damp any flutters of the first (sensing) vane. 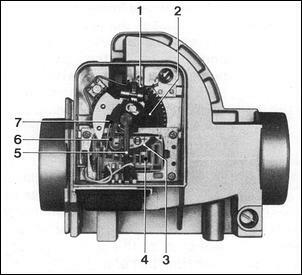 The vane assembly is connected to a potentiometer which allows the airflow meter to output a voltage signal that relates to airflow. Vane Airflow Meters - Not What They Seem! (2) The insides of the meter - both the mechanicals and electricals - are carefully designed so that the meter is very sensitive around low loads, where good driveability requires a high resolution. This means that, strictly speaking, the output signal is not directly proportional to combustion air intake volume. With a vane airflow meter, adjusting the output signal in a coarse way is dead-easy. All that is required is to remove the black plastic cover (it's glued into place and so a sharp knife is needed to cut the bead) and then adjust the spiral spring tension. The spring is used to pretension the vane, so loosening the spring allows the door to open further for a given airflow volume (richening the mixtures) and tightening the spring means that the door will open less for a given airflow (leaning the mixtures). The spring tension is easily able to be adjusted by using a screwdriver to temporarily pry out of the teeth of a cog (shown as '1' on this diagram) a small piece of spring wire that normally prevents it rotating; with this out, the cogged wheel can be adjusted freely to provide more or less tension. Make sure that if you are doing this you don't lose your 'place'. Mark where the wheel is to start with and adjust it only a few teeth either way of that starting point. OK, so the first step in changing the mixtures was to adjust the airflow meter spring tension. But how much to adjust it? Pull the door back too far and the car ran with the staggers - too lean. Push the door a little further open and the car again ran with the staggers - too rich. In the middle of this range, the car idled sweetly. Now, even with no air/fuel ratio measurement at all, the 'middle sweet spot' for idle is going to be reasonably close for air/fuel ratios of about stoichiometric - ie 14.7:1. It might be 15:1 or 14:1, but if you feel what the engine is doing as the vane is manually moved back and forth, it won't be anything like 12:1 or 17:1. Or so went my theory, anyway. I then adjusted the spring tension of the vane so that at idle, this same voltage was outputted by the meter - but this time without my having to manually move the vane. 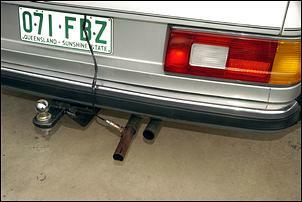 After this adjustment, the car smelt far better (previously, it was so rich your eyes would water from the exhaust fumes!) and idled far better as well. However, while the changing of the spring tension had leaned idle mixtures, it had also leaned mixtures across the whole load range. And that's where the use of the interceptor came in. The prototype interceptor - called the Digital Fuel Adjuster - allows major changes to be made to the airflow meter output signal...if that's required. 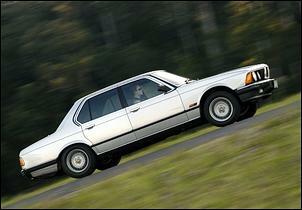 So in the case of the BMW, the spring tension readjustment could have been carried out electronically. The reason that it wasn't is that it's always best to have the meter reading within its normal range (analogous to the swapping-in of a larger airflow meter on an engine that's had a major power boost) and then make the adjustments. The task of the Digital Fuel Adjuster (DFA) was to fine-tune the mixtures over the whole load range - something it can do with ease. It took only a short time to wire it into place - only four connections need to be made - and then tuning could start. Or could it? In this case, some dynamic form of air/fuel ratio monitoring was needed. 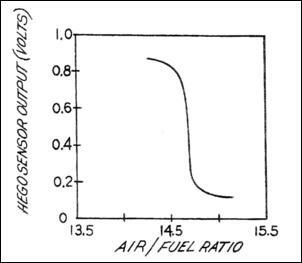 As we have covered in detail in other articles (The Technology of Oxygen Sensors and Cheaply Monitoring Air/Fuel Ratios), normal zirconia oxygen sensors output a voltage that relates to the air/fuel ratio. However, as this type of sensor is designed primarily to tell the ECU when mixtures are richer or leaner than stoichiometric (ie on most fuels, an air/fuel ratio of about 14.7:1), the voltage abruptly jumps from high to low as mixtures go from being rich to lean. In addition, the voltage outputted by the sensor is very sensitive to exhaust gas temperature. This diagram shows the output of a typical oxy sensor. You can see that either side of the 'jump', the sensor still outputs a slightly varying voltage as the air/fuel ratio changes. 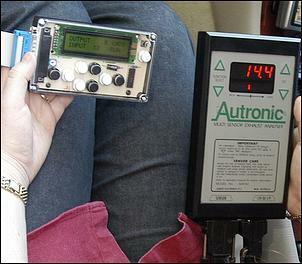 For a fixed temperature, this variation in voltage can be used to quantify mixtures. OK, so let's turn all that back into English. For most sensors, anything around 400 - 600mV can be classed as stoichiometric mixtures, which is fine for idle and all light load cruising. Under load, anything less than 600mV will be bad news - too lean. Instead, you want to see voltages which are at the top end of the voltage scale - whatever that is for the particular oxy sensor you are using. Sound imprecise? Yes, it can be - but remember, in a minute we're going to compare the tuning results of this technique with the measurements of an expensive air/fuel ratio meter. As briefly covered above, the temperature of the oxy sensor can have a major affect on its output voltage... even for the same air/fuel ratio. The easiest way of limiting this variation is to place a heated oxygen sensor in the tailpipe during the tuning. Locating it away from the engine prevents the huge temp spikes (up to 900 degrees C) which an oxy sensor close to the engine can be subjected to. 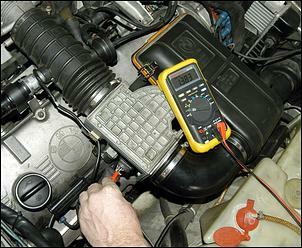 Using a heated oxygen sensor, however, makes sure that it still gets hot enough to output sensible voltages. In this case, the oxygen sensor used to do the tuning was sourced from the local tip. Seriously. There I had found someone disposing of (what looked to be) a Holden V6 exhaust, complete with a 4-wire oxygen sensor in each pipe. They were happy to give it to me instead of the landfill. The heater wires (in a heated sensor!) can be easily found by measuring all the resistances of the wires coming from the oxy sensor - across two of them there will be a low but stable resistance. In the case of the AC AFS75 sensor, the heater coil had a resistance of 4.8 ohms. These heater wires can be connected straight to the battery - after a few minutes, the sensor will be warm to touch. And the other two wires? They connect to a digital multimeter reading millivolts. There are a couple of things to note about the meter. 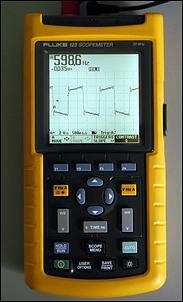 Firstly, it should be of the high input impedance sort - and that's pretty well any decent quality digital multimeter. (This characteristic prevents the meter loading down the signal.) Secondly, it should be able to read a quickly changing signal. This characteristic does vary a lot from meter to meter - those with bar graph displays (in addition to the normal digits) are normally quick sampling. In my case I used an (expensive) Fluke 123 digital multimeter/scope which in addition to reading very quickly, can also draw a line graph showing the input voltage over time. As expected, the oxy sensor voltage at idle was in the 400-600mV range, so little change was made with the Digital Fuel Adjust interceptor at idle and light loads. However, at medium loads the oxy sensor indicated that the mixtures were too lean - voltages were on the low side of the 'jump', rather than the high side. These were easily richened up with the DFA and the car noticeably improved, becoming more throttle responsive. I then progressed to high loads, finding again that the mixtures were apparently a bit lean - about 750mV on the meter. To be safe at high loads, I wanted a voltage over 800mV, and so altered the mixtures until this was achieved. Where possible I used the same driving procedure for each measurement run, helping stabilise the temp of the sensor before making the measurements. After those mixtures changes, the car drove very well and I was confident that it wasn't running lean anywhere. Of course, it may have been a bit rich, but over-rich will only cause a slight power reduction; too lean can be engine-destroying. Lachlan Riddell of ChipTorque was kind enough to make available his Autronic air/fuel ratio meter for some on-road testing. And it was with great excitement that I connected up the meter and inserted its dedicated probe into the BMW's exhaust - how good or bad would my multimeter tuning prove to be? In fact, it was very close. At idle and light loads I had achieved 14.5-14.7 air/fuel ratios, and at medium and full loads the BMW was running a bit rich - 12.5 and 11:1, where 13.5 and 12.5:1 (respectively) were preferable. But the multimeter tune was within 1.5 air/fuel ratios of optimal everywhere, and was 'wrong' on the safe (ie rich) side rather than lean side. The graph below shows the two maps of tuning adjustments made with the DFA - the red bars shows the adjustments made with the multimeter tune, and the red bars the adjustments with the Autronic meter tune. As can be seen, the greatest difference is at high loads, where the car was running richer than necessary. It's important to note a few points. Firstly, the BMW (while still developing about 150kW from a naturally aspirated 3-litres) is not a highly stressed turbo engine. This means it will be able to tolerate incorrect mixtures far better than some engines. Secondly, the engine is standard (although the exhaust is quite loud - perhaps some muffler baffles have gone out the tailpipe!) and so the fuel requirements are going to be fairly close to the mixtures provided by the airflow meter. In other words, the shape of the fuelling curve will be much the same as the factory system was designed to cope with. Both of these factors will not apply to some modified engines. So to assume from this story that anyone with a multimeter and a heated oxy probe up the (car's!) bum can successfully tune any engine on the road is simply not the case. But it's also fair to say that even on heavily modified engines, idle and light load mixtures can be set fairly well using this technique.